Our prices and sizes are all listed below, all prices include VAT. Fancy a size that’s slightly different to those you see above? No problem, we can do other sizes on request; just get in touch! You'll want to decide if you want your canvas ‘gallery-wrapped’. This means that your image will wrap around the sides of the frame, giving your canvas a professional gallery appearance. Gallery wrap canvases are great for photographs where there is no important detail close to the edge, as 45mm of each side of your image will be wrapped around the sides. 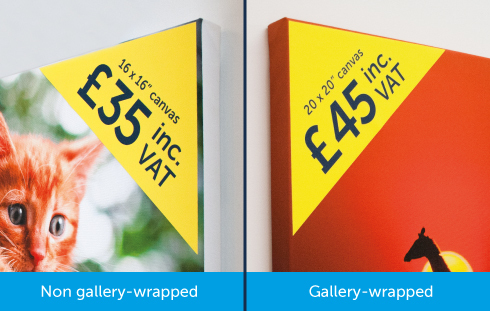 Alternatively, you can have your canvas ‘non gallery-wrapped’, so your image will be printed on the front face only. This ensures that the whole of your picture will be visible and is particularly useful for images with important detail close to the edges or corners. Please note that we will send you a PDF proof before we print your canvas to illustrate what will be visible on the front of the canvas and what will wrap around the sides. Once this has been approved, will we print your order. We use only the best quality 38mm solid pine stretcher bars, genuine HP pigment inks and polycotton inkjet canvas to deliver truly excellent results. Our hand-made canvases make the ideal gift to family or friends. Turn a favourite wedding or holiday photograph into a fantastic home decoration, ornament your lounge with images of your kids or pets, or simply choose a breathtaking view to line your hallway with. We'll print it onto 100% polycotton inkjet canvas material and stretch onto high quality pine wood bars to give your photograph the finish it deserves. They’ll look great anywhere in your home, from the lounge to the bedroom. You could even decorate your office with one! All you need to decide is whether you want to send us your own images or choose one of our professionally taken photographs. As with all our products, we offer same day printing if you place your order before 2pm! It takes longer to print a canvas than it does a regular poster and we have to accommodate for assembly time, but all in it take us between 2-3 hours from start to finish. You will receive an email when your canvas is ready for you to come and collect from our central London shop. Alternatively, we can deliver to you. We offer a same day delivery service to all Central London locations. You will still need to order before 2pm to ensure that your order is delivered the same day. Prices start at just £15. Providing you order with us before 2pm, your order will be despatched on the same day and will arrive the next working day. We send our canvases with APC, you'll get a tracking link via email, and the courier will deliver before 4pm. Next working day delivery is a flat rate of £12 (although some remote areas are excluded). Orders placed with the economy delivery option will usually arrive within 2 to 3 working days from when you placed your order. Economy delivery is free on every order when you spend £30 or more (inc VAT). Otherwise, it is just £4.